After the mega planetary success of Oxygen, Jean Michel Jarre confirms his talent of musician, composer and sound designer with an album at two shutters. In conformity with its concept, which represents 24 hours in a day, the first part of Equinox is a long awakening, like a long process of amazement. Parts I to III are more floating, more ambient whereas rhythms are waking up from part IV, bringing the hearer on the borders of a musical universe still virginal. Light synth strata resound and are multiplying in their echoes, waltzing elegantly in a sphere parallel to slumber in order to lead us out of our long diurnal nap. Layers which are juxtaposing to create a dense opaque musical cloud, as the fog of dreams, and which quietly pour towards a soft ambient movement, just like the after sleep where one would like that everything should be relax. The exactitude of morning amazement is on time with its harmonious snippets that float around our awakening. Equinox II is serene and pacifying with its sound effects that are dandled by a suave mellotron and which made Oxygen nobility. The movement aspirates us in the quietest recesses of our being where one takes time to admire the delicate impacts of synth waves which quietly are transforming into a cosmic ballet with temperate movements. Crystalline notes are agitating on Equinox III opening. The movement is limpid and waltzes in a soft perfume of cosmic sonorities which surround the first works of the French synthesist. A delicate tempo which goes down and up while preserving its melodious approach before it’s slowed down by a static flow, initiating the hatched rhythm of Equinox IV and its percussions felted in the shape of castanets and its hiccupping bass line. 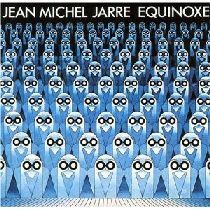 Second big hit from Jarre, Equinoxe IV is as complex as harmonious. The synth there is catchy and the ambiance is fascinating, but the structure that surrounds Equinoxe IV is superbly packed around captivating sound effects which wrap a rhythmic casted by a synth with multiple harmonious lines. Quite simply amazing! Equinox V begins with a strike of thunder. The rhythm explodes like hands slapping on a bedazzled structure, crossed by plead of sound effects. A rhythmic anarchy nourished by a synth with wonderful melodious lines and solos that sound like a strange cosmic organ. The structure deviates gently towards Equinoxe VI which is not any more that the skeleton of Part V. Chords scatter and are merging on sparse percussions which aromatize speakers of an unusual intensity. A completely brilliant electronic dialect which continues lasciviously on the sumptuous Equinoxe VII and its slow tempo metamorphosis eroded by its indiscipline. A tempo which permutes under splendid layers of an oniric synth and a mellotron which is humming around felted percussions which are colliding under a rain of sound effects in constant boiling. The tempo goes up and down, such a musical snake with two heads, to disappear in a cosmic drizzle that initiates Equinoxe VIII. A counting rhyme for travelling acrobats which flows in our ears still infiltrated of a fine rain. And Equinox ceases all musical life under these last notes, vestiges of the whole structure of this superb album whose only defect is to be preceded by Oxygen.